Every year i look forward to the famous Nordstrom Anniversary Sale! Why you ask? Well, this isn't like any other sale where you'll find a few bargains on end of season stuff. This is new Fall merchandise that is currently marked down but prices will be marked up once the sale ends on August 5th! That's essentially what makes this sale so special! I love to stock up on basics... you know, pieces that you know you'll live in during Fall and Winter. 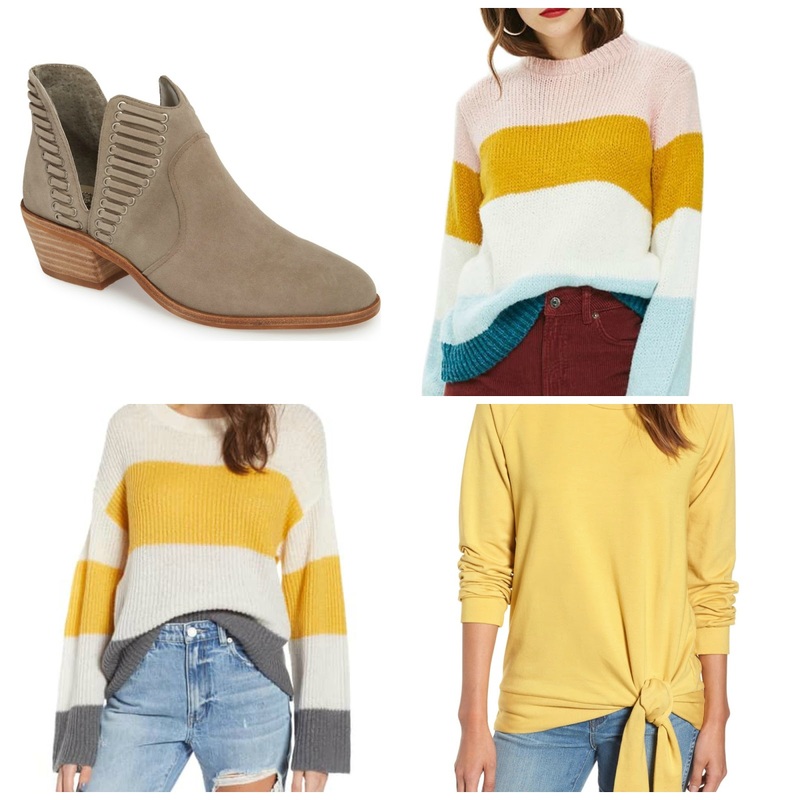 Such items for me personally include basic long sleeve tees, cozy cardigans, sweaters leggings and boots. I think i scored almost everything i wanted this year with a little patience. Yes, things sell out fast but that's because people buy multiple sizes or make impulsive purchases and end up making returns. If there's an item you've had your eye on, keep the page open on your device and refresh it whenever you remember to. This is how i scored two sweaters i'd been dying for! Haha i was determined! I still have my eye on a super cute bucket bag but haven't had luck just yet... but i still have a few days left so i'm still holding out hope! 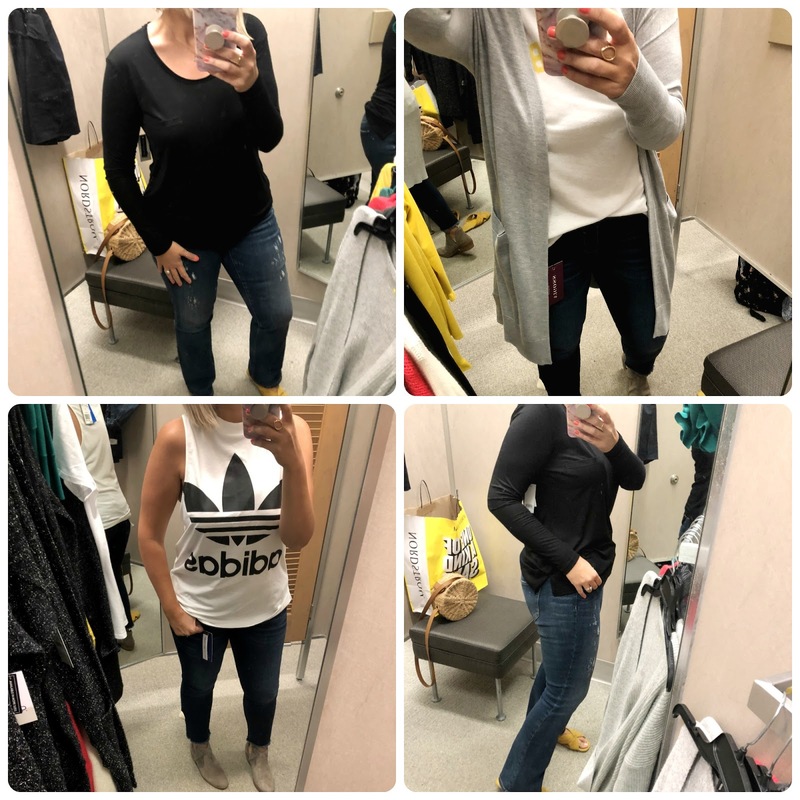 Anyhoo, with the #nsale coming to an end at the end of this week, i though i'd share my fitting room try ons and let you know what i purchased and what i kept! I also ordered a few more items online so all that is in the dressing room is not my complete haul! The cardigan in the upper left hand corner is super soft and soooo cozy. It has a hood and is perfect for those breeze fall evenings when you just need a little warmth! I brought it to the register with the rest of my haul but then spotted this cardi and opted to switch. I still question my decision because it was really nice... uh i want it now! I bought the 'Good Vibes' tee and love it because it's soft and so fun! Besides, it was such a steal! Yellow is one of my favorite colors. I think this top is going to be one of those tops i'll love to pair with a pair of jeans or joggers. It was only $20! The coral sweater was the perfect color. The only reason i didn't get it is because i wish it was a little longer. My friend who's shorter than me bought it and it looks killer on her. I'm 5ft8in for size reference. Okay so i couldn't resist the detail on this cream cardi! Its absolutely beautiful and different from anything i currently own so naturally i bought it! I'm obsessed with the emerald sweater. Love the ruffle detail on the neck and bubble sleeves! The picture on the lower right is actually a cardigan i purchased last year. 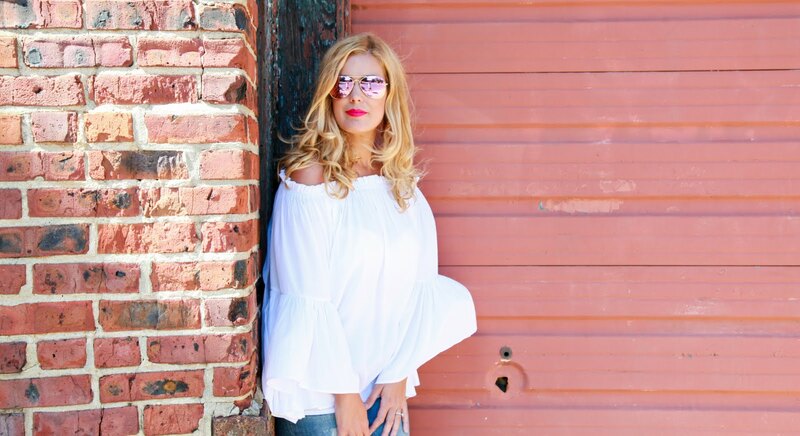 I fell in love with the bell sleeve detail and they brought it back this year! So soft and so worth it! The yellow sweater was super cute though i decided to leave it behind for no reason other than i just didn't really need it. I have a similar one. The green top with the ruffle detail was super cool. The sleeves are actually removable!!!! I loved the idea. The only reason i did not purchase it is because it's a bit heavy. 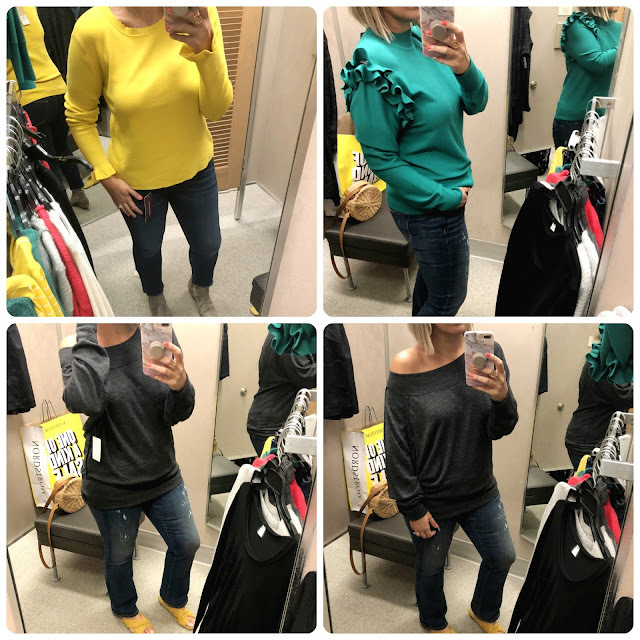 The bottom off the shoulder sweater is awesome! I actually purchased this bralette to wear with it. I love the idea of the straps peeking through! The black tee is the perfect example of a closet staple. I live in these throughout the year so i always try and stock up on a few colors. 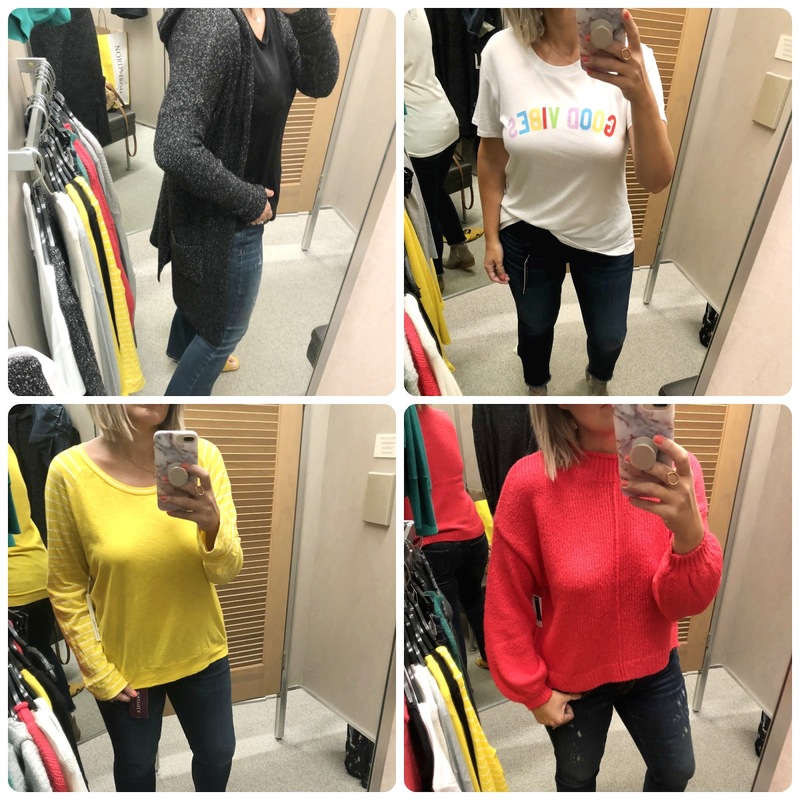 It's soft and comfy and super affordable! 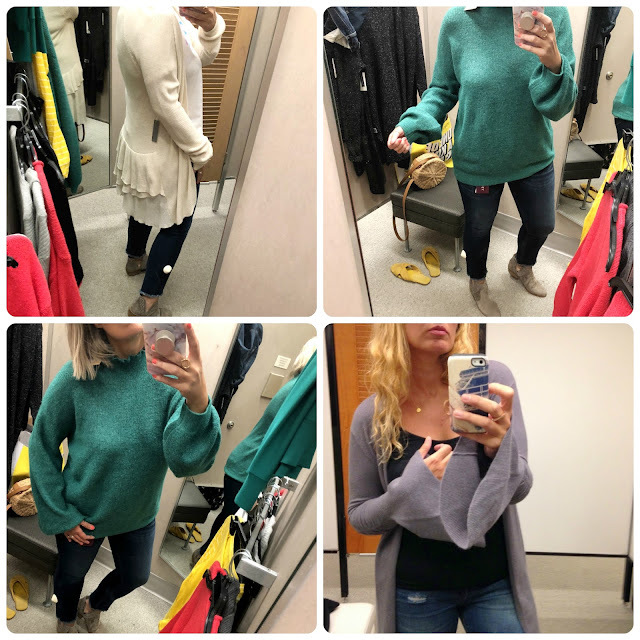 The grey cardi is by far the coziest purchase of the sale. This is the cardi you WILL reach for every single time you need one! In fact, i had lunch at the Nordstrom Cafe after a morning of shopping and it was quite cold so i pulled this baby out and wore it. I did not want to take it off ever... in fact, when i got home i went online and purchased it in black! These are a must! Last year i purchased the adidas workout top in black, so when i spotted it in white on sale i quickly grabbed it. I wear these to the gym all the time! Obsessed with my new booties! So comfy and cute for Fall! I also bought these three sweaters online. The two stripe ones (here and here) were not easy to find. They sold out but every so often came back in stock. I finally secured them in my size! The yellow front tie sweat shirt is so cozy and fun. It pairs nicely with a good pair of leggings. These are the leggings to stock up on during the sale! 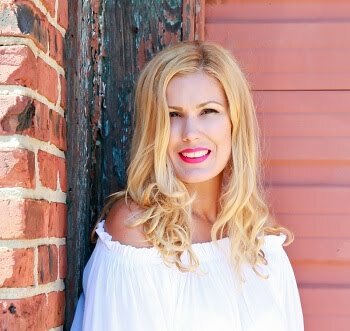 Lastly, these earrings are on major sale and you know how much i love mine! I wore them often and continue to wear them every chance i get! They're so fun! 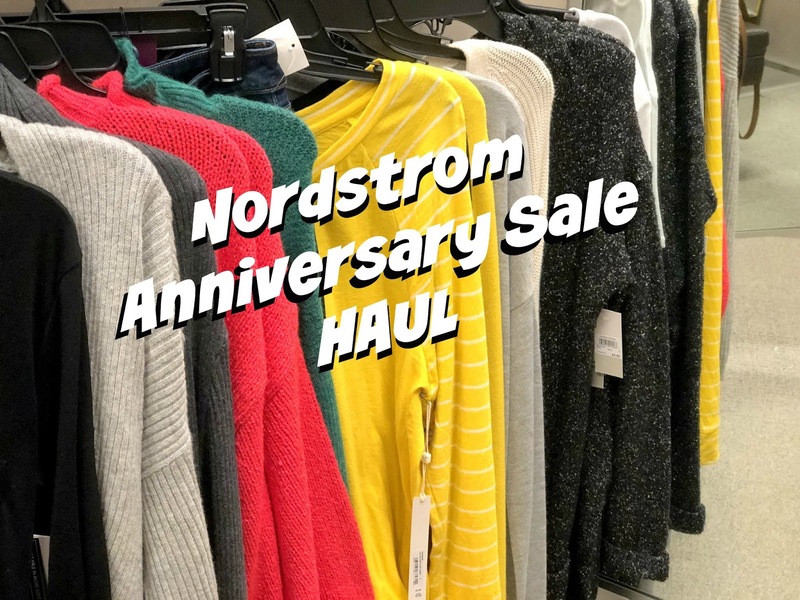 Labels: in stock at the nordstrom sale, nordstrom anniversary sale haul, nsale haul, what to buy at the nordstrom anniversary sale.